Tom Minchella is the executive chef at McKendrick's Steak House in Atlanta, Georgia. Start by making the venison chili: Heat a large skillet over medium high heat. With a sharp knife, slice elk into ½-inch slices. Season meat with salt and freshly ground black pepper. Add olive oil to preheated pan and then add sliced elk. Stir elk with a wooden spoon and brown or sear on all sides. Add onions and garlic and stir occasionally until onions are translucent, about 4 minutes. Add beer, 2 cups of beef broth and all chili spices. Turn heat to low and simmer for 1 hour. Add 1 cup of beef broth to the chili and cook for another hour. As the broth reduces and becomes dry, add more beef broth as needed. Simmer until elk is slightly tender, about 3-4 hours. Add tomatoes to chili and simmer for an additional 45 minutes, adding more broth if needed. Check elk to see if it is tender. Season chili with salt and pepper. Remove venison chili from heat and bring to room temperature. Now you are ready to make the potato skins. Bake the potatoes until soft and then allow to cool. Slice cooled potatoes in half, With a spoon, scoop out about half the potato. Toast potato skins under the broiler until crisp. In a bowl, combine all ingredients for the salsa (tomatoes, onion, garlic and lime). Season with salt and pepper. 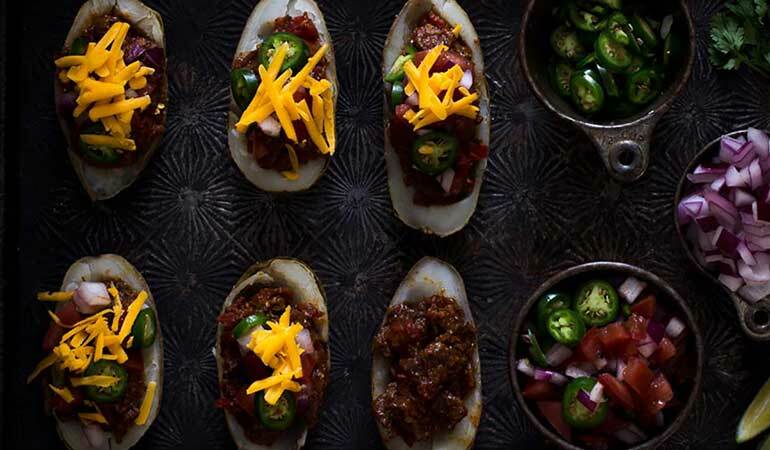 Top crisp potato skins with elk venison chili and then place on a cookie sheet and bake in a preheated 350-degree oven for 15 minutes or until chili is hot. Remove from oven and transfer to a serving dish. Top with salsa and some of the grated sharp cheddar; serve.